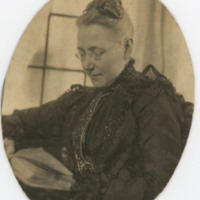 Photograph of Mary Garrett, with hair tied in a bun and glasses, reading a book. 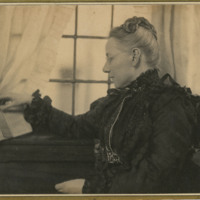 Photograph of Mary Garrett sitting down and reading a book. 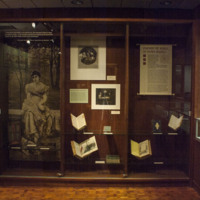 She is facing sideways in the photo and holding the book upright. One student sits at a desk reading a book. Another sits on a chair nearby reading from a binder. 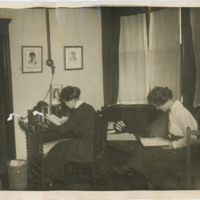 They appear to be in a dorm parlor or study. 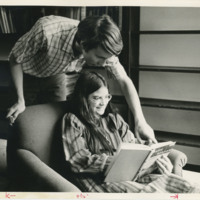 A student sitting in an armchair holds a book titled "Basic Russian" while another student leans over her shoulder and points something out in the book. 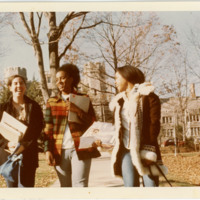 Inscribed on the back is "Radnor Hall, 1972". 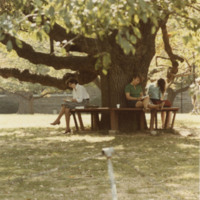 Three students sit on a bench encircling a large tree. All three of them are reading. 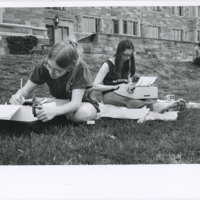 Two students sit against a tree trunk reading. 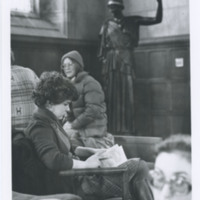 In the foreground is a student sitting, in the middleground a students sits in a chair reading a book, and in the background are two more students talking with the statue of Athena behind them. Inscribed on the back is "Thomas Reading Room 1977".